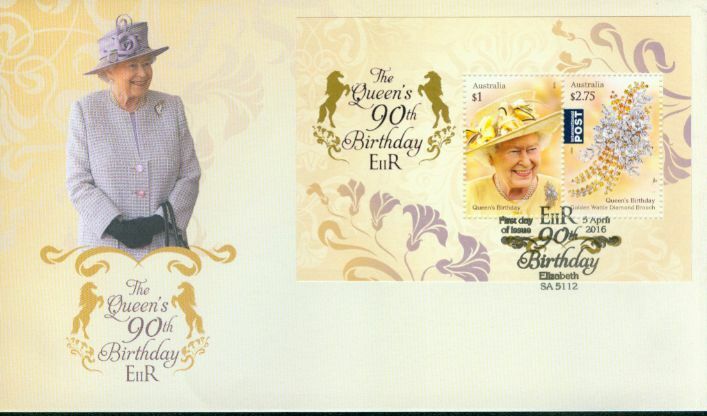 The Queen’s Birthday 2016 stamp issue were released today, 5th April 2016. 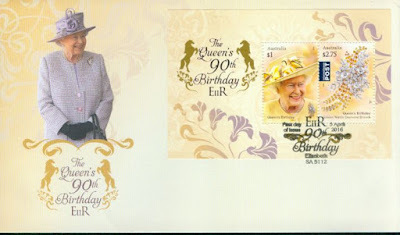 They stamps celebrate the 90th birthday of Her Majesty Queen Elizabeth II on 21st April. 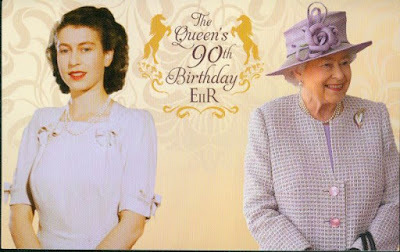 The Queen’s public 90th birthday celebrations will take place during May and June 2016. In Australia (except Western Australia) this year Queen's Birthday public holiday will be celebrated on 13th June. The festivities will reflect Her Majesty’s interests, which include a great love of horses and a significant involvement with the armed forces. Events include four evenings of music, song and dance, coinciding with the annual Windsor Horse show, and many of the performers will represent Commonwealth countries. Both the stamps and the postmark for the The Queen’s Birthday 2016 stamp issue have been designed with birthday celebrations in mind. The postmark alludes to the birthday festivities, through the inclusion of horses as well as graphic elements that symbolise to the pomp and ceremony of the impending birthday celebrations. In the domestic base rate stamp ($1), Her Majesty is pictured attending a garden party for the Not Forgotten Association (NFA), which is held annually to honour the contribution of the armed forces. 2016 marks 95 years since the first official NFA party was hosted by the Queen’s grandmother, Queen Mary. This theme ties into the Queen’s association with the armed forces. It is said that on the day of the NFA party, the Queen greeted every guest, so the stamp also symbolises the Queen’s renowned work ethic. Most importantly, the Queen is pictured looking happy and relaxed. At the NFA garden party, Her Majesty wore the Australian Golden Wattle diamond brooch, which was presented as a gift from the people and government of Australia during the Queen’s inaugural tour of Australia in 1954 – the first ever tour by a reigning British monarch. The brooch is said to be one of the Queen’s personal favourites. 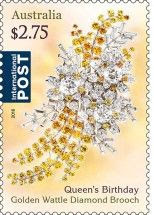 The international stamp features a close‐up photograph of the brooch, which comprises 150 white and yellow diamonds arranged to resemble a spray of Golden Wattle, Australia’s national floral emblem, together with mimosa leaves and tea‐tree blossoms. The brooch was designed by jeweller Paul Schneller and commissioned by William Drummond & Co. The brooch was on public display during 2015, as part of an exhibition at the Powerhouse Museum in Sydney. The photograph has been used with specific permission from both Her Majesty and the Royal Collection Trust. 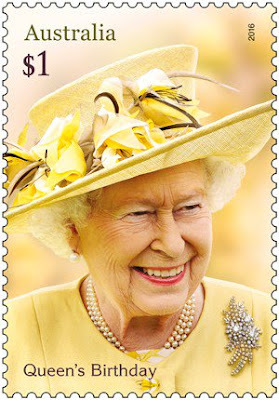 Her Majesty Queen Elizabeth II is the most featured person on Australian stamps. The Queen was depicted on lower denomination definitive stamps issued between 1953 and 1971 and on all base rate definitive stamps until 1973. This was a significant shift, as the reigning monarch had been featured on these stamps for 60 years, save for the controversial and short‐lived replacement of monarch stamps with Kangaroo and Map definitive stamps issued in 1913. However, unlike in 1913, the change had more to do with developments in printing capabilities than it did with making any kind of political statement. That said, while commemorative stamps have long been issued to mark royal occasions, such as the Coronation of Queen Elizabeth II 1953 and the Royal Visit in 1954, following the abolition of queen’s head definitive stamps, only two royal‐themed commemorative stamps were produced between 1973 and 1979. In an attempt to satisfy those members of the public who wished to see more royalty on stamps, Australia Post became the only postal authority in the Commonwealth to release an annual Queen’s Birthday stamp. The Australia Post Queen’s Birthday stamp has been produced every year since 1980, although in 2002, 2003 and 2004, stamps were issued to commemorate the golden jubilee of the Queen’s accession, coronation and first Australian royal tour respectively, and in 2012 to commemorate the Queen’s diamond jubilee year. The process of gaining approval from Her Majesty is a long one, which means that this must be factored in to the production process. Once designs are approved internally, they are sent to the Palace, via the Department of Prime Minister and Cabinet. The Queen’s Birthday stamps can only go to print once official written permission has been received from the Palace, stating that Her Majesty has approved the design. The Queen’s Birthday 2016 stamp issue is available from 5th April 2016 online, at participating Post Offices and via mail order on 1800 331 794 while stocks last.